The control of odorous gases and the corrosion of sewers are the two most important problems in operating wastewater collection systems. Evaluation of existing or potential odor or corrosion problems, and identification of where such problems will occur is, therefore, highly essential. In sanitary sewer systems, odors are produced as a result of biological decomposition of organic matter, particularly those containing sulfur and nitrogen, under anaerobic conditions prevailing in the slime layer of gravity pipes, force mains, and wet wells. Hydrogen sulfide and ammonia are the only malodorous inorganic gases produced from the decomposition. Other odor producing substances include organic vapors such as idoles, skatoles, mercaptans and nitrogen-bearing organics. However, Hydrogen Sulfide (H2S) is the most commonly known and prevalent odorous gas associated with domestic wastewater collection and treatment systems. InfoSWMM gives wastewater engineers a powerful Operations and Maintenance ( O&M) tool to readily model and analyze entire sewer collection systems for sulfide generation and corrosion potential under varying conditions anticipated throughout the life of their systems. Hydrogen sulfide has a characteristic rotten egg odor, is extremely toxic, is corrosive to metals, and is a precursor to the formation of sulfuric acid (which corrodes concrete, lead-based paints, metals, and other materials). The conditions leading to the formation of Hydrogen Sulfide generally favor the production of other odorous organic compounds. Therefore, investigation of the conditions favoring the Hydrogen Sulfide formation not only helps to quantify the potential for odor generation from other compounds, but also it aids in identifying potential corrosion problems in the collection system. The occurrence of Hydrogen Sulfide in wastewater collection systems, other than that added from industrial sources and infiltrated groundwater, is primarily the result of the reduction of sulfate ion ( ), one of the most universal anions occurring in natural waters, under anaerobic conditions, as shown by the following reaction. The partitioning of the hydrogen sulfide into these components (i.e., (H2S) aqueous, HS- ion, and S= ion) depends primarily on the temperature and the pH of the wastewater, although ionic strength, as represented by dissolved solids or electrical conductivity, also affects the partitioning. The HS- ion and S= ion produce no odors. Some of the aqueous hydrogen sulfide will escape into the sewer atmosphere causing the odor problem. The concentration of hydrogen sulfide gas in the atmosphere will vary with the concentration of (hydrogen sulfide) aqueous according to Henry’s law. The rate of escape of hydrogen sulfide gas is a function of the difference between the saturation or equilibrium concentration determined by Henry’s law and the actual concentration of hydrogen sulfide in the sewer atmosphere. The EPA provides a figure that shows hydrogen sulfide in the sewer atmosphere in equilibrium with the given concentrations of aqueous hydrogen sulfide concentration in the wastewater at the respective temperatures, for a pressure of one atmosphere. Prediction of the rate of sulfide buildup and corrosion potential is an essential element in the design of new sewer systems as well as in the evaluation of existing systems. The rate of sulfide buildup depends on a number of environmental conditions, including concentration of organic material and nutrients, sulfate concentration, dissolved oxygen (DO), pH, temperature, stream velocity, surface area, and detention (residence) time. Accounting for all these environmental conditions, InfoSWMM predicts sulfide buildup in sewer collection systems for gravity sewers, force mains, and wet wells using the Pomeroy-Parkhurst equations. 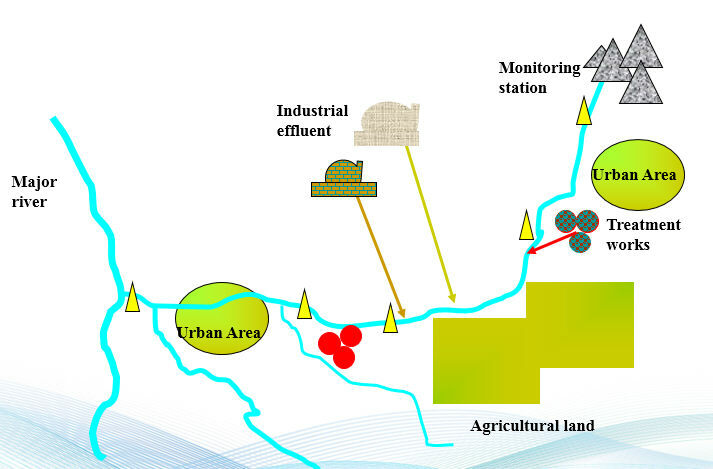 InfoSWMM enables wastewater utilities to pinpoint odor and corrosion problems, develop effective monitoring programs, alert plant operators and sewer maintenance workers to potential danger and the need to observe safety practices, evaluate and implement effective control system such as aeration, chlorination, and mechanical cleaning. As described above, hydrogen sulfide is an acutely toxic material. It can cause serious health hazards even at very low concentrations. The physiological effects (i.e., toxicity spectrum) of hydrogen sulfide are summarized in another figure provided by EPA. The control of odorous gases and the corrosion of sewers are the two most important problems in operating wastewater collection systems. Evaluation of existing or potential odor or corrosion problems, and identification of where such problems will occur is, therefore, highly essential. In sanitary sewer systems, odors are produced as a result of biological decomposition of organic matter, particularly those containing sulfur and nitrogen, under anaerobic conditions prevailing in the slime layer of gravity pipes, force mains, and wet wells. Hydrogen sulfide (H2S) and ammonia are the only malodorous inorganic gases produced from the decomposition. Other odor producing substances include organic vapors such as idoles, skatoles, mercaptans and nitrogen-bearing organics. However, H2S is the most commonly known and prevalent odorous gas associated with domestic wastewater collection and treatment systems. H2S DetectorTM extension for InfoSewer/Pro suite gives wastewater engineers a powerful Operations and Maintenance (O&M) tool to readily model and analyze entire sewer collection systems for sulfide generation and corrosion potential under varying conditions anticipated throughout the life of their systems. Hydrogen sulfide has a characteristic rotten egg odor, is extremely toxic, is corrosive to metals, and is a precursor to the formation of sulfuric acid (which corrodes concrete, lead-based paints, metals, and other materials). The conditions leading to formation of H2S generally favor the production of other odorous organic compounds. Therefore, investigation of the conditions favoring H2S formation not only helps to quantify the potential for odor generation from other compounds, but also it aids in identifying potential corrosion problems in the collection system. The occurrence of H2S in wastewater collection systems, other than that added from industrial sources and infiltrated groundwater, is primarily the result of the reduction of sulfate ion ( ), one of the most universal anions occurring in natural waters, under anaerobic conditions, as shown by the following reaction. The partitioning of the hydrogen sulfide into these components (i.e., (H2S) aqueous, HS- ion, and S= ion) depends primarily on the temperature and the pH of the wastewater, although ionic strength, as represented by dissolved solids or electrical conductivity, also affects the partitioning. The HS- ion and S= ion produce no odors. Some of the aqueous H2S will escape into the sewer atmosphere causing the odor problem. The concentration of H2S gas in the atmosphere will vary with the concentration of (H2S) aqueous according to Henry’s law. The rate of escape of H2S gas is a function of the difference between the saturation or equilibrium concentration determined by Henry’s law and the actual concentration of H2S in the sewer atmosphere. The EPA provides the figure below that shows H2S in the sewer atmosphere in equilibrium with the given concentrations of aqueous H2S concentration in the wastewater at the respective temperatures, for a pressure of one atmosphere. Prediction of the rate of sulfide buildup and corrosion potential is an essential element in the design of new sewer systems as well as in the evaluation of existing systems. The rate of sulfide buildup depends on a number of environmental conditions, including, concentration of organic material and nutrients, sulfate concentration, dissolved oxygen (DO), pH, temperature, stream velocity, surface area, and detention (residence) time. Accounting for all these environmental conditions, H2S Detector predicts sulfide buildup in sewer collection systems for gravity sewers, force mains, and wet wells using the Pomeroy-Parkhurst equations. H2S Detector enables wastewater utilities to pinpoint odor and corrosion problems, develop effective monitoring programs, alert plant operators and sewer maintenance workers to potential danger and the need to observe safety practices, and evaluate and implement effective control system such as aeration, chlorination, and mechanical cleaning. As described above, H2S is an acutely toxic material. It can cause serious health hazards even at very low concentrations. The physiological effects (i.e., toxicity spectrum) of H2S are summarized in the following figure provided by EPA. 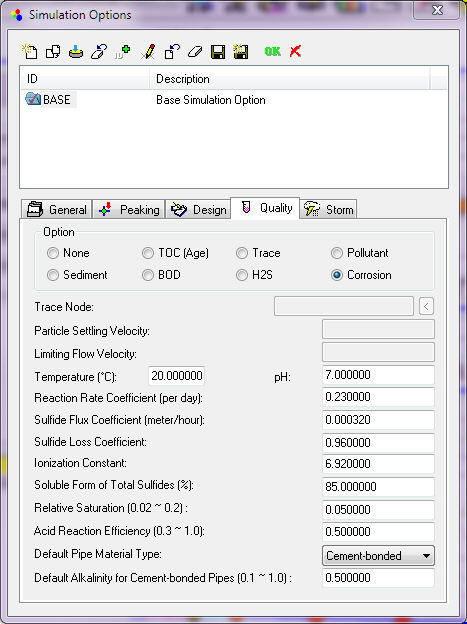 These parameters are available when the H2S option is selected. Hydrogen Sulfide results are generated in addition to any other pollutants entering the system. Note that BOD must be defined as a pollutant and enter the system to simulate Hydrogen Sulfide generation and propagation. Pollutant – Enter the pollutant ID used to predict Hydrogen Sulfide buildup and transport. This pollutant (BOD) must enter the drainage system via runoff, groundwater, or node inflow for any hydrogen sulfide buildup or corrosion prediction to occur. Reaction Rate Coefficient – A first order coefficient (per day) which varies with the type of waste. The default value is 0.23/day. Temperature – average daily temperature for the region (in oC). pH – The pH of the wastewater. The normal pH range of municipal wastewater ranges from 6.0 to 8.0. Sulfide Flux Coefficient – The effective sulfide flux coefficient for sulfide generation by the slime layer in gravity sewers (meter/hour). For conservative analysis (i.e., observed sulfide buildup generally less than predicted), the suggested values of this parameter is 0.00032. Sulfide Loss Coefficient – A dimensionless coefficient to account for sulfide losses by oxidation and escape to atmosphere. For conservative analysis (i.e., observed sulfide buildup generally less than predicted), the suggested values of this parameter is 0.64. For moderately conservative analysis a value of 0.96 is suggested. Ionization Coefficient – A logarithmic ionization constant for hydrogen sulfide (unit less), a function of temperature and specific electrical conductance of the waste water. Its value generally varies from 6.67 (at a temperature of 40oC and specific electrical conductance of 50,000 micromhos/cm) to 7.74 (at a temperature of 10oC and specific electrical conductance of 0 micromhos/cm). Soluble Sulfide (%) – The percent of total sulfides that occur in the soluble (dissolved) form for the wastewater, most frequently known to vary from 70 to 90 percent. Corrosion is one of the primary reasons that sewer systems lose their structural integrity. Corroded sewer pipes may allow greater inflow and infiltration into the collection system, further deteriorating reliability of the network by causing undesirable conditions such as surcharges and overflows, ultimately requiring premature replacement of the pipes. Corrosion of unprotected concrete or metal surfaces is primarily due to the production of sulfuric acid in sewer systems through oxidation of hydrogen sulfide gas by bacterial action on the exposed surfaces under aerobic conditions. This type of corrosion is commonly referred to as microbially induced corrosion. Corrosion in InfoSWMM H2OMap SWMMInfoSWMM SA Pro suite helps wastewater engineers to predict the rates of corrosion of the sewer pipes in their collection systems under varying environmental and hydraulic conditions. It enables them to pinpoint corrosion problems, prioritize repairs, specify corrosion resistant materials or select other forms of corrosion protection (e.g., protective linings). Next, some or all of the produced sulfuric acid reacts with the pipe material causing corrosion, mainly at the inside pipe wall above the wastewater flow line. The amount of sulfuric acid that reacts with the pipe material depends on the rate of production of the acid, which in turn depends on moisture, the presence of oxygen, and the mass emission of sulfide gas. If the rate of acid production is slow, almost all of the acid will react with the pipe material. If the rate of production is rapid, much of the acid will not be able to diffuse through the material. Consequently, it will be carried down the walls of the pipe and into the flowing wastewater stream where the sulfuric acid reacts with alkalinity producing sulfate ion. In addition to the concentration of acid present, the corrosive effect of sulfuric acid varies according to the type of pipe material used and the ambient temperature. Cementitious pipes, including ferrous pipes with mortar lining, experience a reaction that converts the surface material into a pasty mass, which is primarily a calcium sulfate (CaSO4), commonly referred to as gypsum. This pasty mass may fall away and expose new surfaces to corrosive attack. Ferrous pipe materials may experience surface reaction in which a portion of the material is dissolved and a portion is converted to iron sulfide, yielding a hard bulky mass that forms on the exposed surface. A warm and humid environment creates good condition for microbial induced corrosion. The rate of pipe corrosion depends upon the rate of sulfuric acid production, the amount of the produced sulfuric acid that reacts with the pipe material, and the alkalinity of the pipe material. Sulfuric acid production is related to the amount of hydrogen sulfide gas that escapes to the sewer atmosphere, which in turn depends on a number of environmental and hydraulic conditions previously described in relation to hydrogen sulfide buildup, partitioning, and release. Corrosion PredictorTM uses the following equations to estimate rate of corrosion for cementitious (cement-bonded) materials and ferrous materials in gravity sewers. In force mains, where the lines flow full, there is generally no internal corrosion since generation of sulfuric acid is prevented. = flux of H2S to the pipe wall, g/m2.hr. A = alkalinity of the cement-bonded material, expressed as CaCO3 equivalents. Approximately 0.18 to 0.23 for granitic aggregate concrete, 0.9 for calcareous aggregate, 0.4 for mortar linings, and 0.5 for asbestos cement. These parameters are available when the Corrosion option is selected. Corrosion results are generated in addition to Hydrogen Sulfide and any other pollutants entering the system. Material-Type – The conduit material ( i.e., cement-bonded or ferrous) for gravity pipes. Cement-bonded Alkalinity – The alkalinity of the conduit material expressed as CaCO3 equivalents (for cement-bonded materials only). This value approximately ranges from 0.18 to 0.23 for granitic aggregate concrete, 0.9 for calcareous aggregate, 0.4 for mortar linings, and 0.5 for asbestos cement. Acid Reaction Coefficient – The coefficient of efficiency for acid reaction considering the estimated fraction of acid remaining on the wall. This value could be as low as 0.3 and will approach 1.0 for a complete acid reaction. Relative Saturation – The relative saturation of Hydrogen Sulfide in the air compared to equilibrium concentration (typically 2 to 20 percent), expressed as decimal fraction.